Ms. Larios loves teaching first grade because it is such a joy to be with the students every day and see their independence, curiosity, and love of reading emerge. She especially enjoys inquiry units about China, Africa, and the ever-changing Solar System. She is proud to teach at Burley as part of a team that is committed to instilling a love of learning and fostering student curiosity. Some of her favorite authors to teach and inspire first grade readers and writers are Tomie DePaola and Cynthia Rylant. Ms. Larios became a teacher because their is no greater joy than to see the growth and development in my first graders as they develop as readers, writers, mathematicians, scientists and much more!I have been using 1:1 iPads in my classroom for many years now and I am always looking for ideas and other different ways to implement them into my classroom instruction. Ms. Larios has three beautiful children. Her oldest is a sailor in the United States Navy -- and a Burley graduate -- and her son and daughter are currently Burley students. She loves Burley and couldn't and wouldn't dream of working anywhere else. During her spare time, she likes to go horseback riding with her children and visit favorite sites in the area, like the Chicago Botanical Garden. Some of her favorite authors are Shel Silverstein, Dr. Seuss and Tomie DePaola. 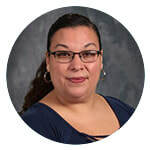 Ms. Larios loves movies, and some of her favorites are Sing, Coco, and Wonder.